Minister Arye Deri’s is obsessed with eradicating any state recognition of Reform and Conservative Judaism in Israel. Now he’s submitted the “State Conversion in Israel” bill, which would for the first time legislate the exclusive authority of the state-established rabbinic bodies over conversion. The Minister of the Interior is a sore loser. What’s worse, he’s a sore loser with an attitude. The attitude I’m referring to is Minister Arye Deri’s obsession with eradicating any state recognition of Reform and Conservative Judaism in Israel. He has made this amply clear recently in relation to the Israeli government’s historic Kotel compromise. And now he’s back at it, having just submitted the “State Conversion in Israel” bill, which would for the first time legislate the exclusive authority of the state-established rabbinic bodies over conversion. Since the 60’s, the Supreme Court has made a consistent distinction between the civil and religious arenas when interpreting the question of “Who is a Jew?” For the civil arena – such as the Law of Return and the population registry – the Supreme Court holds that the interpretation should be a civil and pluralistic one. In the religious realm – primarily for purposes of marriage and divorce – the substantive law defined “the Law of the Torah,” namely Orthodox halacha or religious law, as the law governing marriage and divorce for Jews in Israel. And the definition of who is a Jew for these purposes was also according to Orthodox halacha. 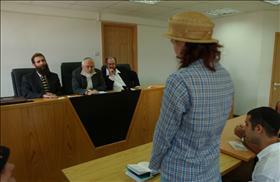 In an attempt to predetermine the outcome of a long-pending case before the Supreme Court regarding the refusal of the Ministry of the Interior to accord Israeli non-Orthodox converts with rights under the Law of Return, the ministry pulled this proposed law out – just two days before the scheduled hearing. The State representative informed the dismayed justices that it would be useless on their part to proceed and render a decision, because it is the state’s intention to have the new law applied retroactively to the cases currently pending before the Court – since 2005! This proposed bill is but another demonstration of the tremendous gap between governmental policies on matters of religion, which the Orthodox political parties dictate, and the Israeli public. An overwhelming majority of Israelis support equal recognition of all major Jewish religious streams, acceptance by the state of converts from all streams, and a rejection of the Chief Rabbinate’s monopoly. Minister Deri and his fellow ultra-Orthodox politicians along with the Chief Rabbinate, are no longer content with merely delegitimizing Reform and Conservative Judaism. They are now determined to block recent Modern Orthodox initiatives that challenge the Chief Rabbinate’s monopoly in key areas, such as marriage, conversion and kashrut. Moreover, Minister Deri and his fellow ultra-Orthodox politicians along with the Chief Rabbinate, are no longer content with merely delegitimizing Reform and Conservative Judaism. They are now determined to block recent Modern Orthodox initiatives that challenge the Chief Rabbinate’s monopoly in key areas, such as marriage, conversion and kashrut. The memorandum attempts to justify its goal with falsehoods and whitewash. It claims to merely follow up on a formalistic point raised by the Supreme Court last year, when it upheld – as a Jew under the Law of Return – the rights of a woman converted by a wellknown ultra-Orthodox rabbinic court. However, that Supreme Court ruling is anything but formalistic. The court follows a line of precedents, which rejected the misguided notion that public interest, Jewish unity and safeguarding against abuse of conversion requires state recognition to be limited only to conversions conducted under the auspices of the Chief Rabbinate. These false arguments are at the very base of the current memorandum. The memorandum claims this bill is needed in order to prevent a split in people’s personal status and avoid a splintering of the Jewish people. The Supreme Court has repeatedly rejected these claims when the state raised them in the past. The Court saw Jewish unity as based on inclusiveness of all streams and views. Clearly also, the noble intention to prevent “split status” would better be resolved by doing away with the Orthodox monopoly over personal status, rather than by introducing further coercion and fundamentalism into the area of conversion. The rise of alternatives is a clear testament to the failure of the Chief Rabbinate and religious monopolistic model. The artificial and cynical nature of the claims regarding “split status” and splintering the Jewish people are apparent. By this logic, overseas non-Orthodox and Modern Orthodox conversions that result in aliyah pose as much of a challenge to Jewish and status unity as those performed in Israel. Yet, in an attempt to preempt Diaspora protest, the memorandum promises that nothing will change regarding overseas conversions. Clearly the proposed bill is not intended so much to prevent “split status” and harm to Jewish unity, but to block non-Orthodox and Modern Orthodox Judaism from enjoying equal rights in Israel. This is an opportunity to also punch a hole in the myth of the Neeman Commission. I had the privilege of representing the Reform movement on the Commission. There was good will and earnestness from all its members. But as opposed to the myth created by the late Prof. Neeman, the commission never reached an agreed-upon report, which was a condition agreed to by Prime Minister Benjamin Netanyahu when he appointed it. Clearly, under no other conditions would the Reform and Conservative representatives, who were a minority of the members, be willing to serve on the commission. Prof. Neeman aspired to bring peace to the Jewish people. It naturally required, not only the consent of the commission members, but also that of the Chief Rabbinate. In the final steps leading to the formulation of the commission’s draft report, Neeman pleaded with the chief rabbis to embrace his approach. Alas, in a formal, published decision, the Chief Rabbinate rejected it vehemently, decrying any cooperation with the non-Orthodox movements, even as Prof. Neeman stressed that the movements’ participation would be limited to the instruction phases, not to the actual conversions, which would be solely done by Orthodox conversion courts appointed by the Chief Rabbinate. During the last phase of the commission’s work, I also refused to endorse Neeman’s proposed report. I agreed that the non-Orthodox movements would strongly recommend to potential converts to go that route, but I refused to accept the draft’s provision that Israel would no longer recognize non-Orthodox conversions conducted here. It would serve the authorities well to search their files and realize that as well intended as this reference to the commission’s recommendations may be, it’s only a myth, and no such agreed-upon, let alone signed document exists. The memorandum pretentiously quotes from the governmental resolution regarding the “process of preparation for conversion in the framework of the Institute for Jewish Studies that was created for that purpose will reflect the totality of the Jewish population in Israel, its shades and streams.” It is the Chief Rabbinate’s hard line and hostility towards the non-Orthodox movements that has prevented this noble plan from being realized, as was clearly stated to the Supreme Court in the hearing last month. If this bill passes, it will create for the first time in Israel’s history, exclusivity in conversion for the rabbinic courts operating under the auspices of the Chief Rabbinate. It will exacerbate the rift between Israel and Jewish communities around the world, from Modern Orthodox to non-Orthodox; it will undermine Jewish unity, which cannot exist without respect and embracing of diversity; and it will turn its back upon the rich tapestry of Jewish conversion tradition throughout history and as it exists among the multi-denominational Jewish people today. The only reason behind this legislation is an attempt to exclude Reform, Conservative, and Modern Orthodox alternatives in Israel. All the rest is empty rhetoric.